Hopefully I can go out, the doctor said just 1 week before driving, but I do not think I will be up to cleaning my house and entertaining even if it is just coffee, tea and bought cakes. For my 70th I invited my walking group back to the house after a walk, probably about 20. My sister searched the internet and found a private house not far away from me where the lady made cupcakes to order. Of course I had to pick them up. Hope that everyone is doing well! i'm feeling very satisfied today, as the past few days have been very productive. On Tuesday, Wednesday and today, there was an 'offsite' meeting in Boston. People in my position were not required to go, but everyone else was, so it's been very quiet at work the past three days. I used those three days to get all of my filing for 2018 done, and straightened up a few sloppy shelves in our file room and supply room. It's stuff that needed to be done, but we were never able to get it done. Now, we can move on to the next thing. Hopefully I can go out, the doctor said just 1 week before driving, but I do not think I will be up to cleaning my house and entertaining even if it is just coffee, tea and bought cakes. For my 70th I invited my walking group back to the house after a walk, probably about 20. My sister searched the internet and found a private house not far away from me where the lady made cupcakes to order. Of course I had to pick them up. I hope that you have a speedy healing, and that you are able to have your friends over for tea and cakes. Happy weekend everyone! Hope that you are are relaxing and having a good day. Went out for some groceries today, that I'll use on Tuesday. At my job instead of giving you something for your birthday, the birthday person brings in something. Usually it's breakfast, but this year I decided to do something different, and bring in lunch. I went out today and got a bunch of sandwich rolls, mayo, mustard, oil, vinegar, and large bags of chips. On Tuesday morning before I go to work, I'll stop at the store and get fresh lettuce and tomato, and a large selection of fresh cold cuts, and everyone can make sandwiches for lunch. I've also decided that I will give myself a present for my birthday, but not until June. I'm going to go buy a new car. My current car is 15 years old, and starting to show her age. It's time for an upgrade. I've not decided what one to get, but I'm leaning towards a Chevy. My current car is a Chevy, and she's lasted this long, and has had no major problems. Still has original transmission and engine, the only replacements have been basic maintenance, brakes, shocks, filters, stuff like that. The radiator was replaced once. 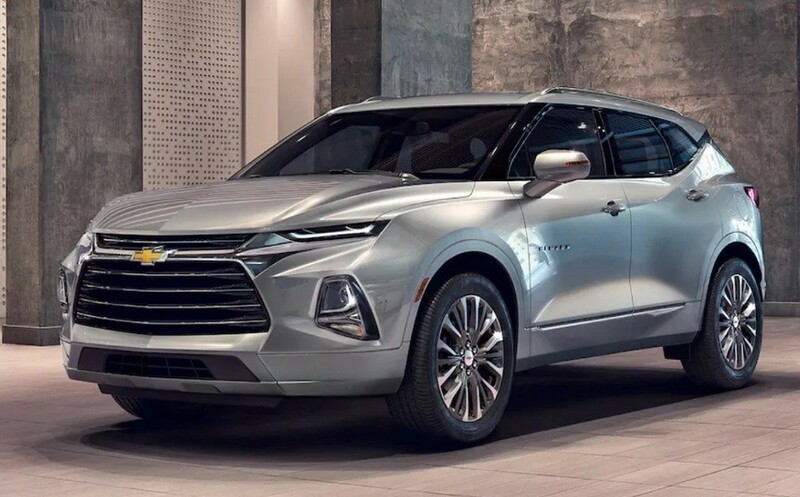 I do like how the 2019 Chevy Trailblazer looks, but I'd have to drive one to see how she handles. This is the model and color I would want. I've also decided that I will give myself a present for my birthday, but not until June. I'm going to go buy a new car. My current car is 15 years old, and starting to show her age. It's time for an upgrade. I've not decided what one to get, but I'm leaning towards a Chevy. My current car is a Chevy, and she's lasted this long, and has had no major problems. My third car, and the only new one I've ever owned, was a Chevy, and it never gave us a bit of trouble. I should never have gotten rid of that car, but at the time I was young and stupid and wanted something more sporty. I'm past the "young and stupid" age, and I think I've safely passed or suppressed the "midlife crisis" feelings, so I won't be getting anything "sporty". I do want a model that is a little bigger than the one I have now. I feel like anyone who sits in the back seat is a little cramped. I've owned two new cars, three inherited used cars, and two purchased used cars, including the car I drive now. I bought it when it was three years old. It's still working pretty well seven years later. The body doesn't look great (multiple fender-benders, like the time the plastic garage cans attacked the side of my car and the time a telephone pole ran into the bumper. But functionally, it's fine, and still has low miles (90,000) for its age (10 years). I believe that's less than Chrissi said she drives in a year! In Europe, where gas is probably still kind of expensive. It's a Mazda 3, which is semi-sporty for an ordinary compact car. But it dents more easily than, say, SUVs. The only used car I have owned was my first one which my parents gave me in lieu of a 21st birthday party. It was a 1958 car which i was given in 1965 but literally owned by a little old lady. I did buy a 2nd hand Kombi camper in London in 1974 but ended up replacing the engine in Germany then taking it back to London to sell. I would like to replace it with an electric vehicle. they are becoming quite popular but still expensive and not good for touring yet. Quiet day scheduled here today, just laundry to be done. Other than that, it should be a relaxing day. I've had numerous cars through the years, but only one new one, which is the one I have now. All the used cars seemed to have their share of problems when I owned them. The new car was the one that seemed to require the least amount of work. I'm hoping this will hold true for the next car. Electric cars are becoming popular, but I'm not sure I'd get one at this point. If this car also lasts 15 years, I'll only be 65. If I'm still able to drive at that point (I'm assuming I would be, my dad is 80 and still is driving, but only during daylight hours) perhaps the next car will be electric.